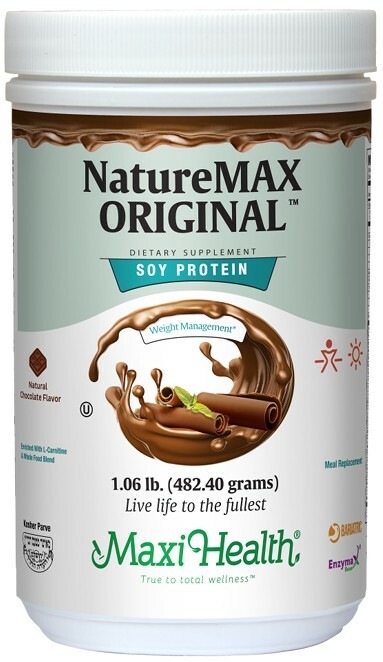 Naturemax™ is a creamy rich chocolate, delicious, drink enriched with easily digestible soy protein and much more. It supplies you with fibers, enzymes, amino acids, vitamins, essential minerals and powerful antioxidants. Check out the directions and supplement facts tab for yourself. Our proprietary formula is rich in clinically studied phytoestrogens such as soy isoflavones, diadzein, and genistein. Supro® is an isolated soy protein with a P.D.C.A.A.S. (Protein Digestibility Amino Acids Score) equal to 1.0, the highest possible score. It is equivalent in protein quality to milk or egg protein and meets or exceeds the essential amino acids requirements of children and adults. Wheat grass juice and barley grass juice are rich in chlorophyll, beta-carotene, calcium, vitamin C, and many other vitamins and minerals not commonly found in food. Enzymax® is a vital digestive enzyme complex that helps you absorb the nutrients you need to stay healthy. L-Carnitine supports optimal health as it plays a main role in fatty acid metabolism. As a dietary supplement for weight control, you will want to combine Naturemax™ with Maxi Thin Supreme®, D&S Control and Maxi Green Tea Concentrate. Supplement the needs of you and your entire family with gluten free Naturemax™ Rich Chocolate! As a dietary supplement add one measuring scoop (included) of Naturemax to 8 fl oz (or more) of cold skim milk, whole milk, or juice, 1-3 times daily, or as directed by a healthcare practitioner. (for best results use blender or mixer). Isolated soy protein (Non-GMO), fructose, cocoa powder, psyllium husk powder, calcium carbonate, dextrose, guar gum, acacia gum, xanthan gum, magnesium oxide, natural flavor, lecithin (from sunflower), ascorbic acid, inositol, L-Carnitine (50 mg), choline bitartrate, Earthrise® spirulina, sucralose, d-alpha-tocopheryl succinate, niacinamide, bee pollen powder, zinc oxide, apple pectin, manganese sulfate, ferrous fumarate, d-cal pantothenate, retinyl palmitate, citrus bioflavonoid complex, Enzymax® (calcium carbonate, bromelain, papain, lipase, amylase, protease, silica), selenium glycinate complex, papaya fruit powder, organic barley grass powder, organic wheat grass powder, TRAACS® chromium nicotinate glycinate chelate, cholecalciferol, pyridoxine HCL, molybdenum bisglycinate chelate, riboflavin, thiamine mononitrate, folic acid powder, biotin, potassium iodide, cyanocobalamin. This product contains no wheat, gluten, dairy, yeast, artificial flavors, or colorings. No added salt. Earthrise® is a registered trademark of Earthrise Nutritionals. Enzymax®, a vital digestive enzyme complex, is a registered trademark of Maxi Health Research® LLC. TRAACS® is a registered trademark of Albion Laboratories, Inc.